In order to cater the diverse requirements of buyers, we offer the Brass Wire Mesh in different sizes. 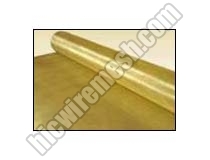 We are an eminent Manufacturer, Supplier and Exporter of Brass Wire Mesh from Varanasi, Uttar Pradesh, India. The Brass Wire Mesh offered by us is manufactured in conformity with international quality standards and norms. We are capable of delivering bulk orders of the Brass Wire Mesh within allocated time. We are also the manufacturers of copper wiremesh and phosphorus bronze wire mesh which widely used in defence and paper board mill industries.